The group studied architecture, the origins of democracy, the current politics and economy of Greece, tried to cook Greek food, watched an interesting movie about Hercules, and learned useful phrases in modern Greek. Following the full slate of culminating K-term project presentations on campus, nine students from the sophomore Washington trip and various freshman projects joined the group for the flight to Athens on Friday, March 8. 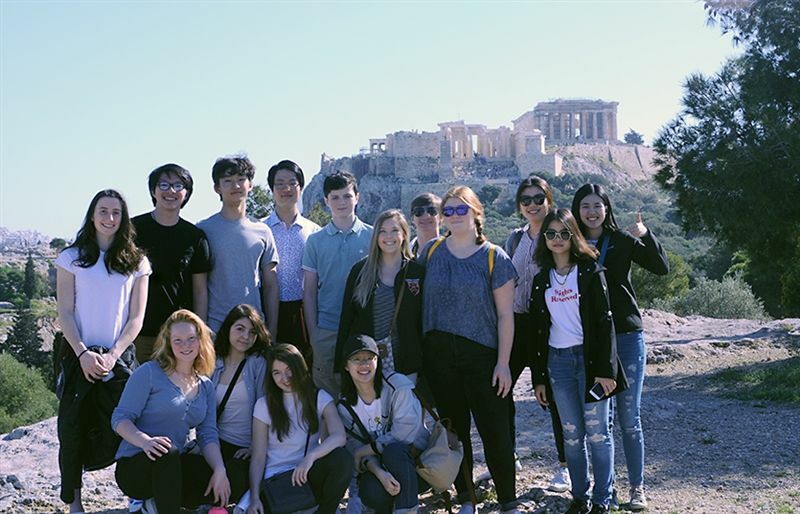 The trip was organized by CYA – College Year in Athens – a program for college students who study classics and other subjects for a year or a semester. CYA provided a guide who led the group efficiently around the city. During the tours, a different CYA professor was available at each site to lecture and answer questions: the Parthenon, Parliament, food markets, current Athens, etc. At the CYA building, the group was offered a Greek cooking session and lessons in Greek dancing. Students also had occasional free time to find their own lunches and shop the many craft stalls. One highlight was the drive to Olympia and the chance to run a race in the stadium of the first Olympics. The students agreed that the trip gave them the chance to get to know others they might not encounter during a typical day in Meriden. Several remarked how happy they were to have made new friends. The trip ended on Sunday, March 17 having had a good K-term and great first week of vacation.